Jason Kenney and Rachel Notley. Alberta is in store for arguably the nastiest election battle in the province’s history. Alberta is in store for arguably the nastiest election battle in the province’s history. 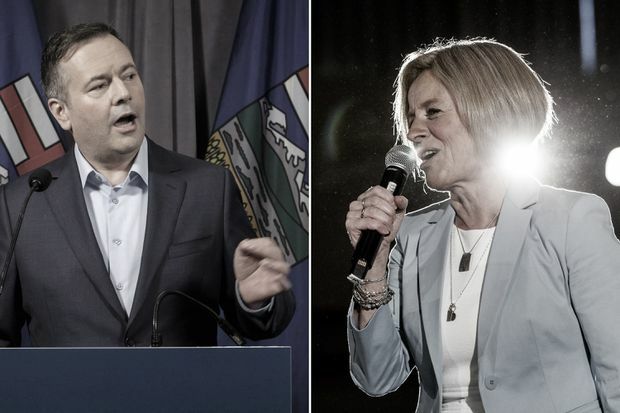 In announcing an April 16 election date, NDP leader Rachel Notley branded her central opponent – the United Conservative Party’s Jason Kenney - a liar and a cheat and someone who heads a party with a racism problem. You can expect that will be a theme repeated often on the campaign trail. This election was supposed to be a foregone conclusion. With Alberta’s once robust economy continuing to sputter, polls have regularly put Mr. Kenney’s party anywhere from 15 to 25 points ahead of the New Democrats. It was thought that only a scandal of a significant nature could derail the UCP’s path to power; the Conservatives would have to extend a hand up to the NDP to make the race competitive. And wouldn’t you know it, that’s exactly what they’ve done. In the last 72 hours, allegations have been made that Mr. Kenney and his top advisers concocted a cynical scheme to run a “kamikaze” candidate during the UCP leadership race in 2017 whose sole purpose was to attack Brian Jean, who was also seeking the position. The alleged plan allowed Mr. Kenney to remain above the fray, while others did his dirty work. Ten members of a UCP board in Calgary resigned in protest on Monday, so disgusted was it by the allegations. On top of that, one of Mr. Kenney’s star candidates, Caylan Ford, was forced to step down after reports surfaced alleging she had “echoed white nationalistic rhetoric” in a message exchange on Facebook. (Although denying the charge, she said she was withdrawing so as not to be a distraction to the UCP campaign). It all adds up to a mess for the purported premier-in-waiting, who no doubt is hoping that the campaign trail will allow him an opportunity to change the nature of the disturbing conversation that has suddenly enveloped him. In the absence of further revelations in “kamikaze-gate” he may be able to – despite Ms. Notley’s best efforts to make the central question on the campaign trail one about about integrity and character and who is most fit to be premier. That said, Mr. Kenney has several things going for him. The Alberta economy has suddenly stalled after a rebound year in 2017. Oil prices remain stagnant. Economists are talking the dreaded “R” word again. Unemployment numbers remain stubbornly high. The fate of the Trans Mountain pipeline expansion remains uncertain. The province’s debt continues to climb to unforeseen and unimaginable levels. Prime Minister Justin Trudeau is despised in the province, and Ms. Notley’s mostly warm relationship with him is seen as a giant liability for her. The carbon tax is hated. Add it all up, and you have – or perhaps had - the recipe for a potential landslide win. Now we don’t know. Although, my suspicion is it will take a lot for Albertans to put questions about Mr. Kenney’s character above their concerns about the economy and the province’s ledger sheet. In virtually every federal and provincial election in Canada, voters ask themselves a fundamental question: am I better off today than I was when this government took power? In a recent interview, I asked Ms. Notley how she thought her government and party will fare on that issue. Of course, she is right. The collapse of oil prices was a phenomenon beyond her scope. And so, quite frankly, was completion of the pipeline. There is nothing Jason Kenney could have done that would have changed either fact. Despite his insistence to the contrary, you can’t bully the rest of the country into building you a pipeline. If it were that simple, there would have been many more constructed by now. For her part, Ms. Notley says she’s not concerned about naysayers who insist she doesn’t have a chance.